Moderately moist to dry. 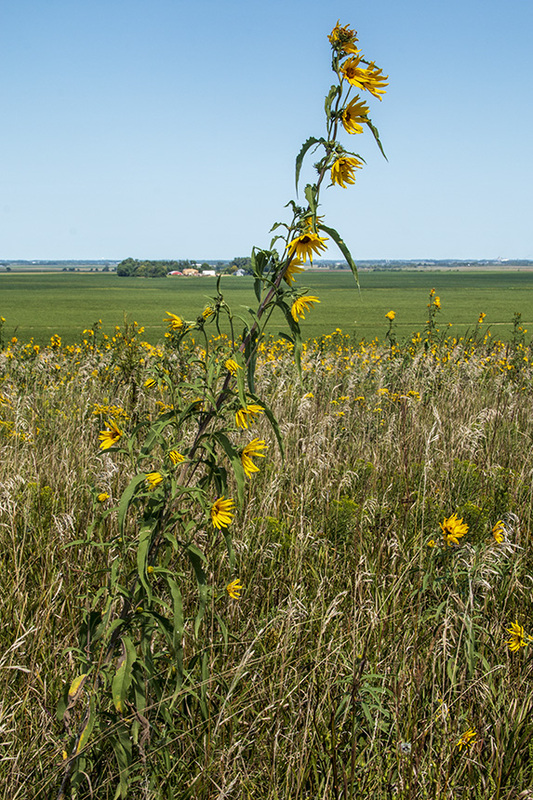 Prairies, railroads, roadsides, disturbed areas. Full sun. Sandy soil. 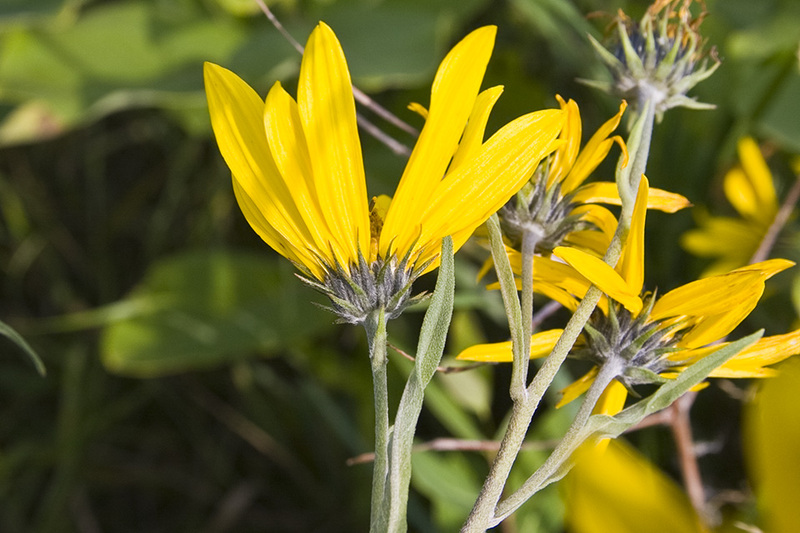 This is an erect perennial forb that rises often on several stems from a short-creeping rhizome and fleshy roots. It often forms dense colonies. 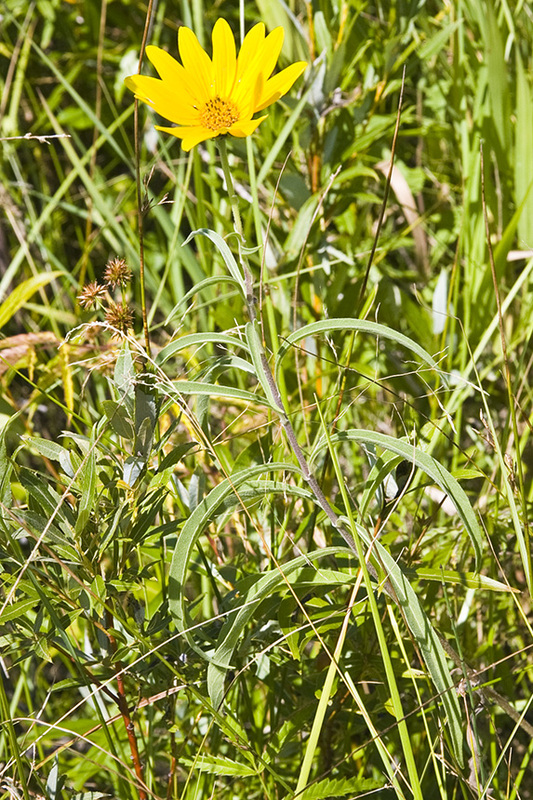 It can be from 24″ to 120″ tall, though in Minnesota it is it is usually no more than 72″ in height. It sometimes forms colonies. 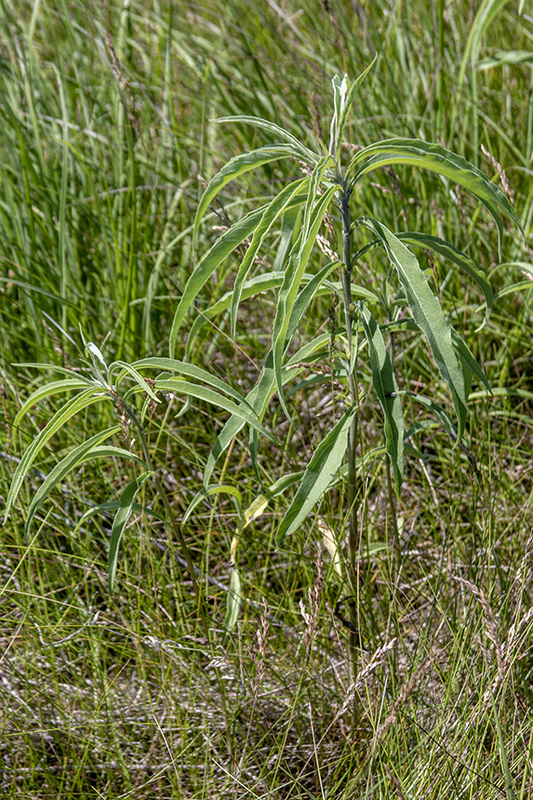 The stems are erect, stout, round, rough to the touch, and light green or sometimes reddish. They are not glaucous. They are moderately to densely covered with white, short, stiff, ascending hairs, especially near the top. They are mostly unbranched below the inflorescence. There are usually more than 30 leaf nodes on the stem. There are no basal leaves. 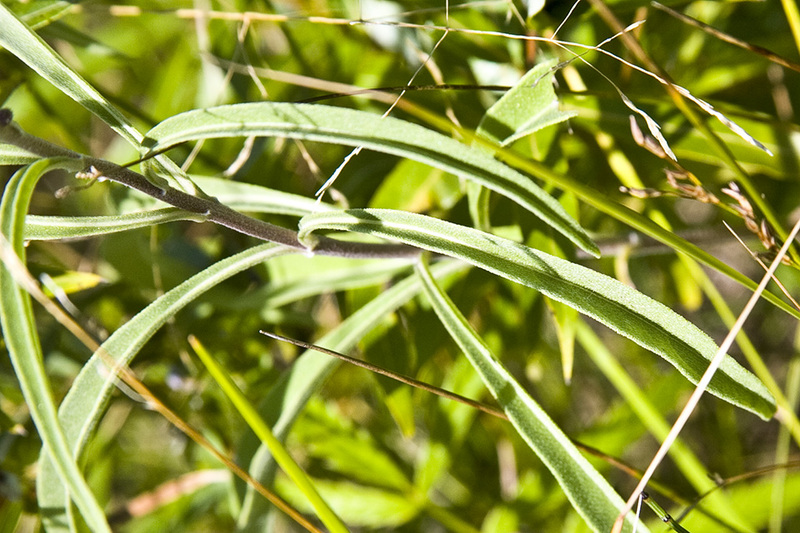 Lower stem leaves are opposite and short-stalked, middle and upper leaves are alternate and short-stalked or stalkless. All leaves are firm, lance-shaped or narrowly lance-shaped, 1½″ to 11½″ long and 3 ⁄16″ to 23 ⁄16″ wide, 7 to 20 times as long as wide. 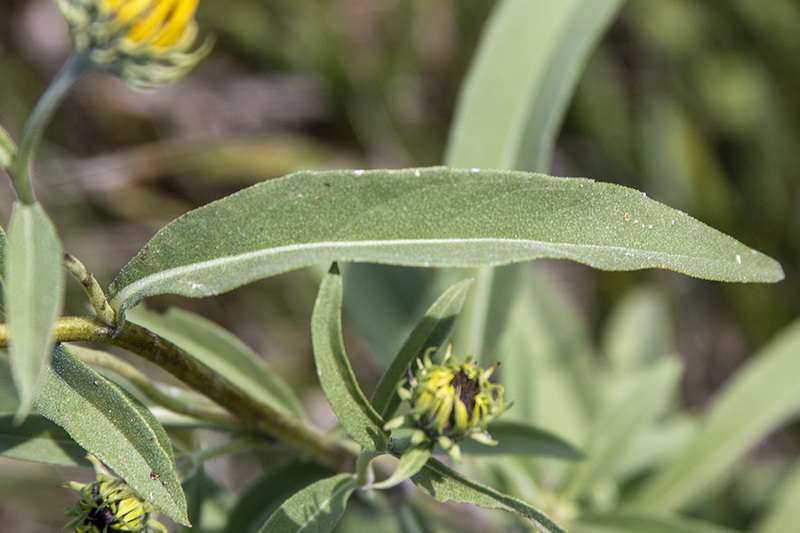 They taper at the base to a winged leaf stalk that is up to ¾″ long, and taper to a sharp point at the tip. The leaf blade is folded horizontally along the midrib, rises at the point of attachment, then arches downward longitudinally. The upper and lower surfaces are grayish-green and rough to the touch. They are covered usually densely, sometimes moderately, with minute, white, appressed hairs. The margins are usually untoothed, sometimes with minute, widely-spaced teeth. 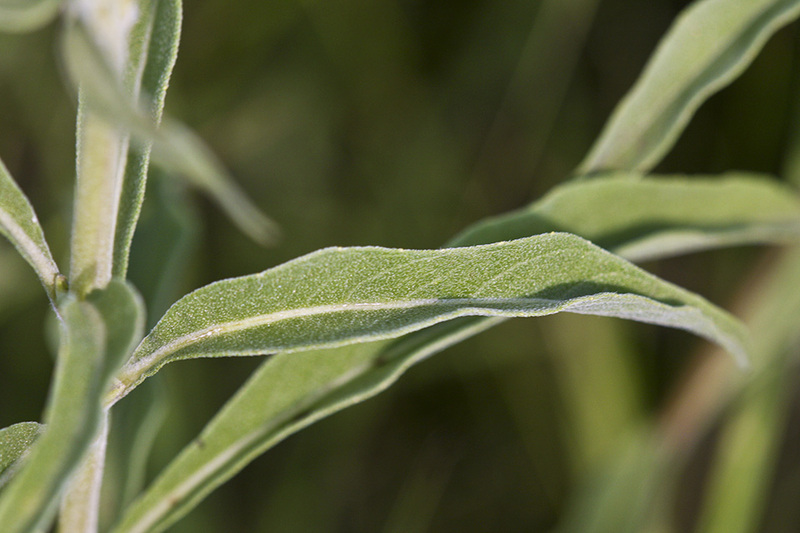 The leaves have a prominent midvein and no prominent lateral veins. The inflorescence is occasionally a solitary head at the end of the stem. 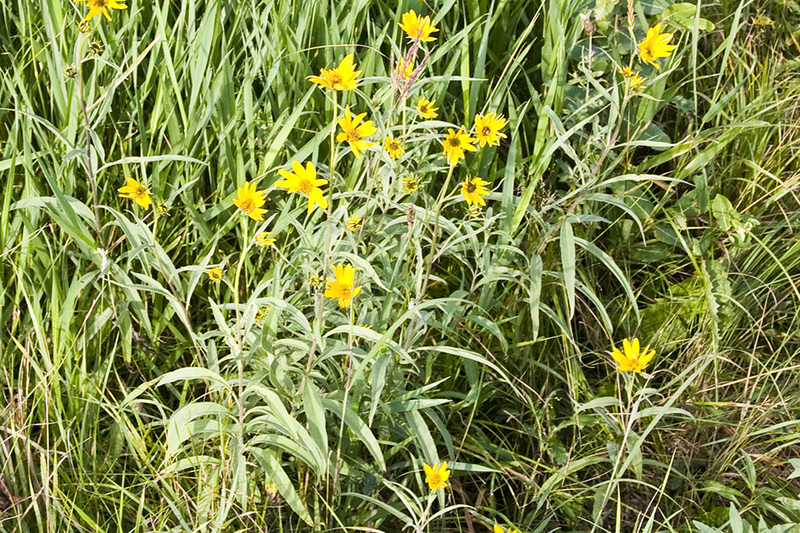 More often, it is an unbranched clusters of 3 to 15 flower heads at the end of the stem along with solitary heads or small clusters rising from the upper leaf axils. 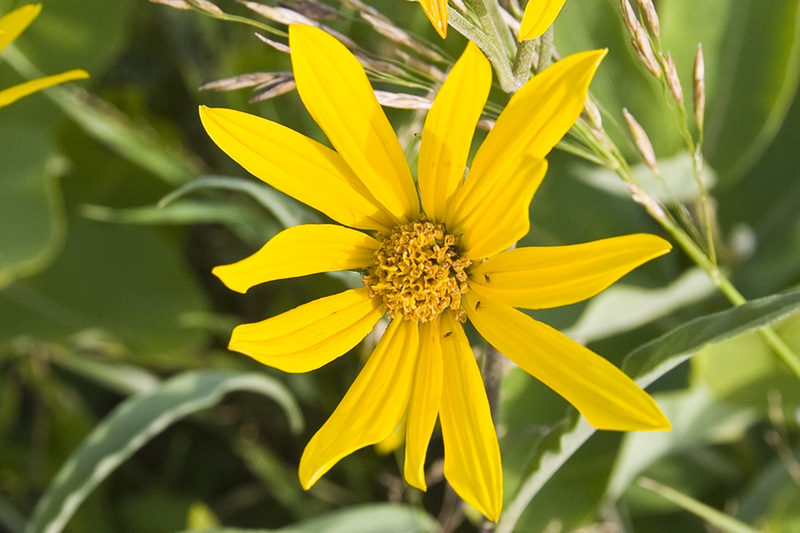 The flower heads are 1¾″ to 4″ wide on stalks that are ⅜″ to 4⅓″ long. 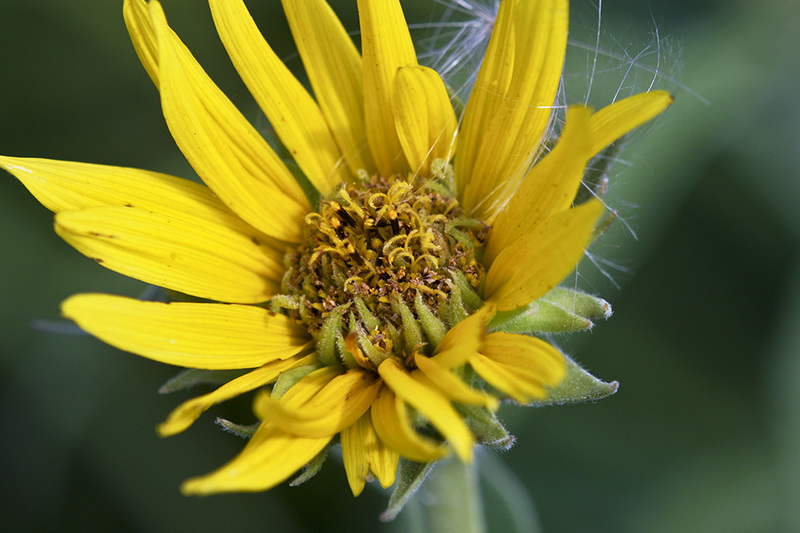 There is a whorl of 30 to 40 bracts (involucre) in 2 or 3 overlapping series at the base of the flower head. The involucre is hemispheric in shape and ⅝″ to 1⅛″ in diameter. 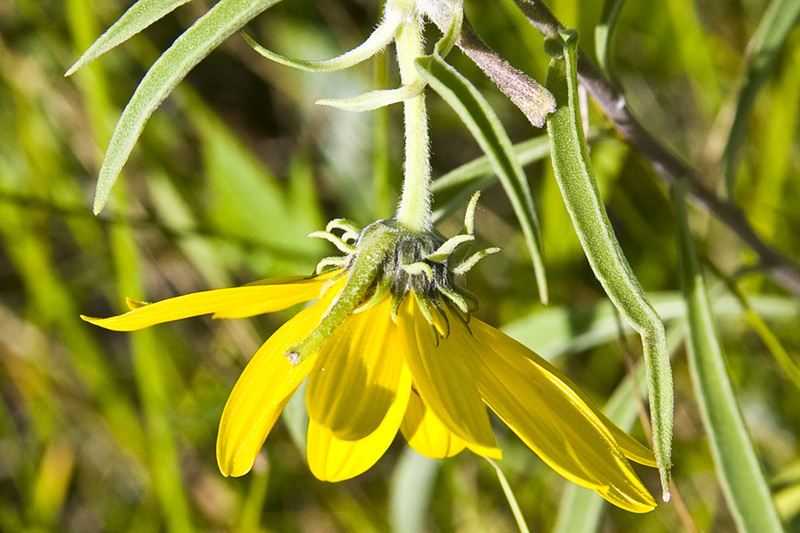 The bracts are loosely ascending, and are spreading or bent backward at the tip. They are narrowly lance-shaped to nearly linear, and taper to a sharply-pointed tip. They are moderately to densely covered on the back with short, white hairs, and have a dense fringe of short hairs along the margin, at least near the base. 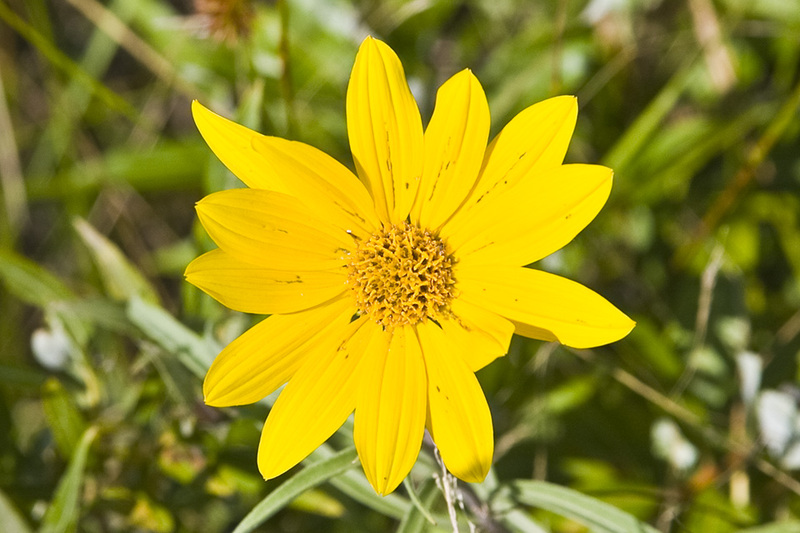 There are 10 to 25 yellow ray florets and 75 or more yellow disk florets. 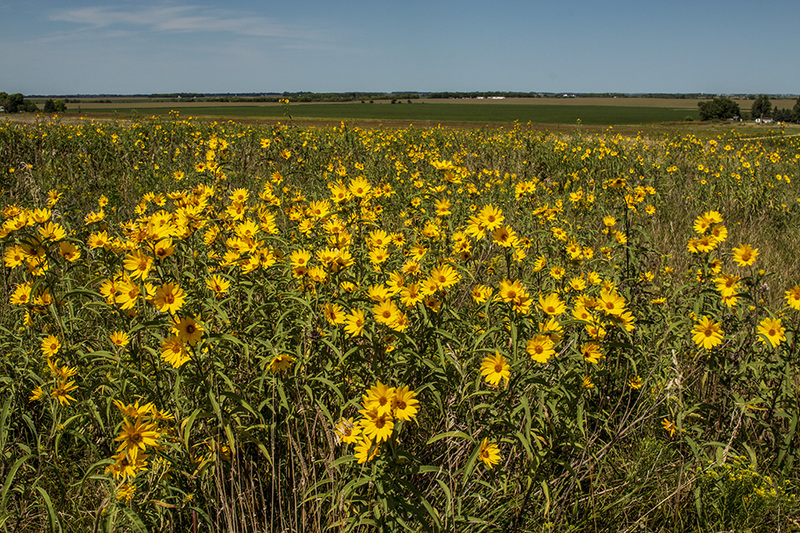 The grayish-green foliage and narrow, single veined, arched, folded leaves distinguish this species from all other sunflowers in Minnesota. Native rhizomatous perennial, stems to 2 m tall, leaves characteristically arch downward and somewhat folded longitudinally, pappus comprising a couple of deciduous scales, achenes not strongly compressed, common in wet meadows and along stream banks. 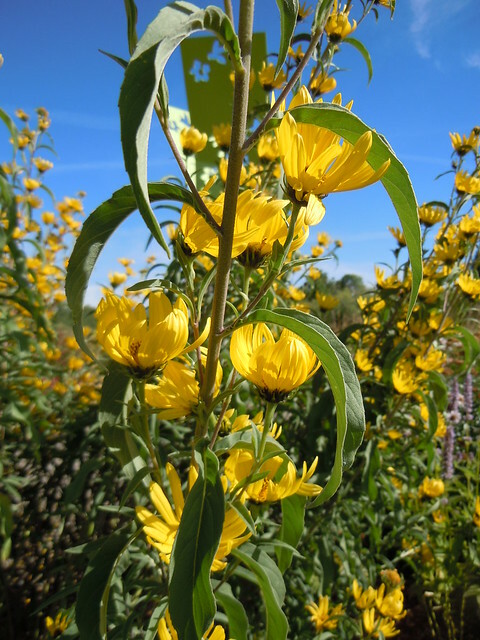 Todays native plant is the Maximilian Sunflower (Helianthus Maximiliani). 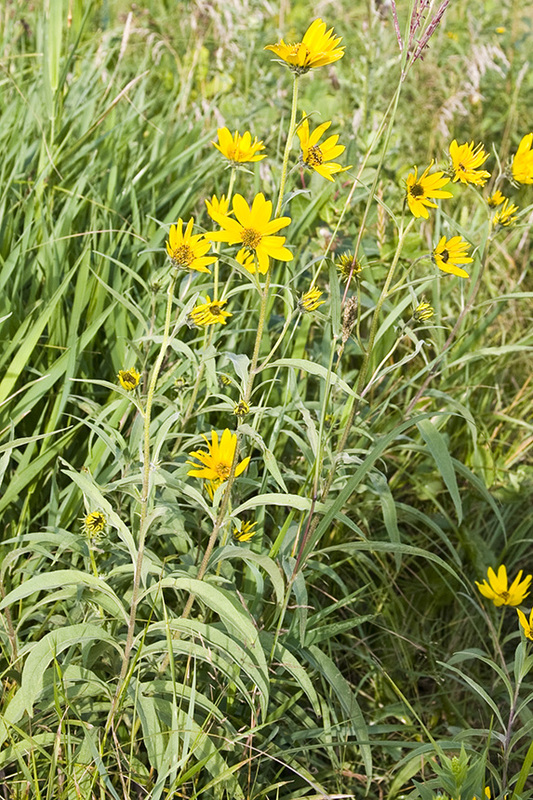 A large plant for wet prairies and near water features.